Just over two hours from Athens, the ancient 'navel of the world' now brims with cultural gems, astounding nature and great food and shopping. Visited throughout the year by an estimated 500,000 tourists from around the world, the UNESCO World Heritage archaeological site of Delphi is one of the most stunning in the world. Once the sanctuary of the famed Pythia – the soothsaying high priestess of Apollo – the site was once the focus of pilgrimages as few major political decisions were taken in ancient Greece without first consulting the oracle (despite the legendary ambiguity of her ‘prophecies’). Do like the ancients and start your visit at the rotund Tholos of Athena Pronaia, where those who came to petition the Pythia first offered a sacrifice. Next walk up to the Castallian Fountain, where worshippers of Apollo bathed before entering the site, and drink mineral water at the nearby mountain spring. Then head up into the main site, along the Sacred Way. You’ll stop in your tracks upon coming across the site’s most important monument, the Temple of Apollo, the god of music and truth and the mythical source of the oracle’s prophecies. It was here that the ancient sanctuary was unearthed in 1892, (until then the site lay buried under the village of Kastri). Put aside at least three hours to explore the site; the all-day ticket for the site includes a visit to the Archaeological Museum, which presents exhibits of mind-boggling beauty like the perfectly intact bronze statue of the Charioteer (470 BC), the Large Sphynx of Naxos and the two identical man-sized Kouroi among many others. Once only walked by locals and pilgrims, the ancient paths at the foot of Mt Parnassos are becoming increasingly popular among hikers, who year-round can choose among paths with varying degrees of difficulty to admire the landscape, villages and monuments. A native of Arachova village who grew up hiking, skiing and mountaineering, Giorgos Korodimos runs Trekking Hellas Parnassos and leads several walks. 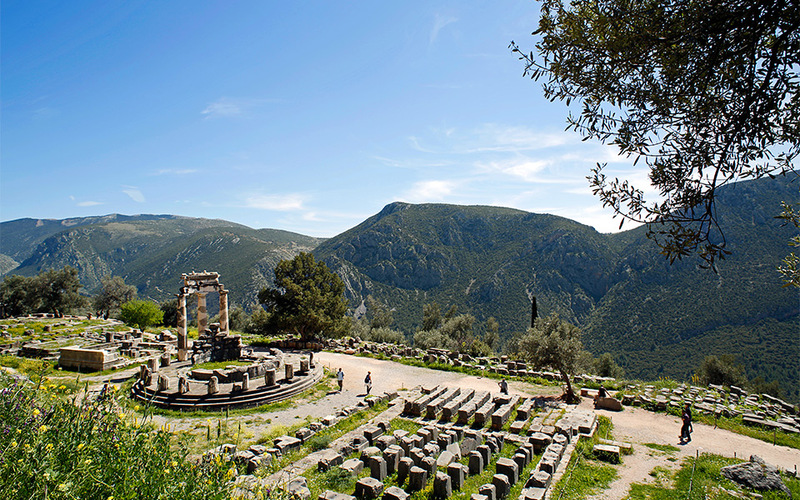 Join him to hike along the ancient footpath of Delphi that takes you from the village to the mystical Corycean Cave though to be the site of pagan rituals since neolithic times. Alternatively venture up Mt Parnassos along flower-filled paths and visit abandoned mountain shelters, springs and caves. 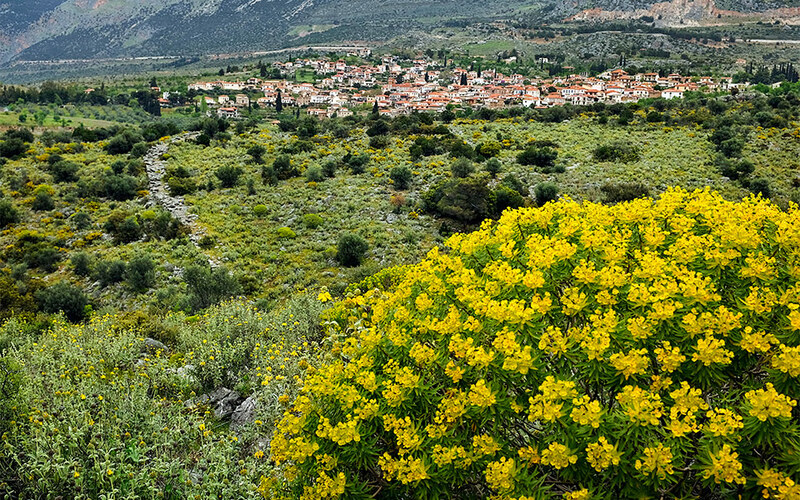 Yet another ancient trail from Delphi runs past the quaint village of Hrisso, with a breathtaking view that stretches over the verdant olive grove of Amfissa down to the sea in Itea, once the site of an ancient port. Korodimos also organizes mountain biking tours, mini triathlons and treasure hunts upon demand. 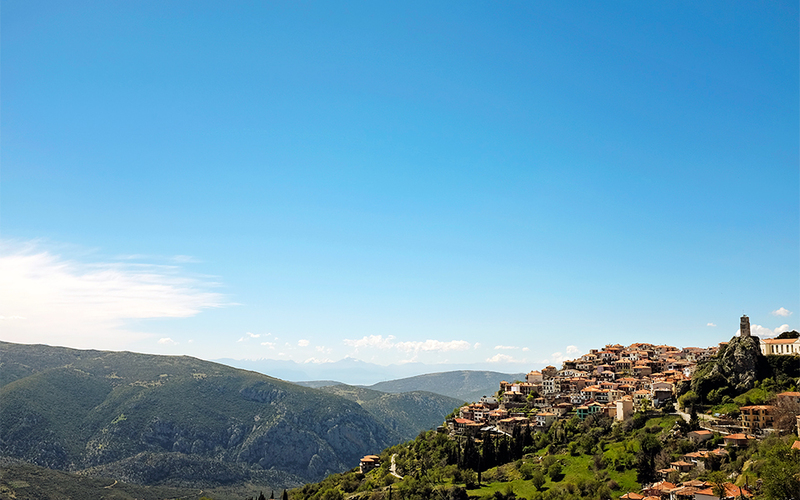 Despite its connection to the astounding archaeological site of the same name, the huge number of visitors it receives annually and its impressive clifftop position, Delphi village is not the most attractive spot. At its entrance you’ll see two roads rising upward lined with somewhat dated tourist shops, tavernas, cafes and small, folksy hotels. Busloads of chattering teenagers on school trips periodically fill the streets to buy trinkets and then it falls quiet again, with just the sound of a cantankerous rooster from one of the houses and laundry flapping in the breeze. However, once here, there are two wonderful places any art lover should visit. 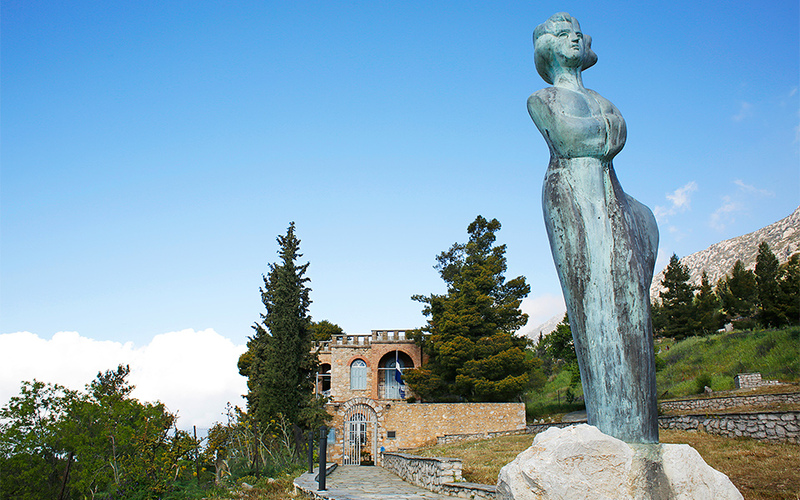 The Angelos and Eva Sikelianos Museum is the former home of the famous Greek poet and his American wife Eva Palmer, who together realized the Delphic Festivals. In 1927 and 1930, international audiences crowded into the ancient Theater to attend dance and theater performances organized entirely by the visionary pair. Even the costumes were made by Eva out of pure silk on her loom, which remains in the house next to a piano. The efforts of Eva and Angelos Sikelianos served as a catalyst for the creation of the European Cultural Center in 1977. Since then the center has been hosting cultural events and is well worth visiting to admire sculptures and paintings by a plethora of acclaimed Greek artists such as Yiannis Tsarouchis, Alekos Fasianos and Giannis Gaitis. A charming village made up of traditional stone houses, nearby Arachova has been baptized as the ‘Mykonos of the Mountains’ thanks to its trendy cafes, voguish boutiques and choice restaurants. Every winter the village overflows with (often fashion-conscious) skiers visiting Greece’s most famous ski resort. Here you’ll find top global brands of clothing, skiing and outdoor gear, a concept store called L’escalier, designer shoes and unique accessories along the main shopping street and beyond. Sandwiched between glossy stores you’ll also find shops selling local food products. Must-tries in Arachova include Formaela cheese (customarily served as melted ‘saganaki’ with a squeeze of lemon), Amfissa olives, organic mountain herbs and tsipouro firewater. Relax in Lekka Square for a coffee, or enjoy delicious local specialties like slow-cooked, free-range wild boar, goat or rooster with handmade pasta at Panayota, Fasouli or Kaplanis. Alternatively, for more cosmopolitan fare head to French restaurant Le Sapin and drink well-mixed cocktails at Isidora Gallery Bar, Sehre or Dr John Chillout Bar. A good way to burn calories from all that delicious food and drink is to walk up to the church of St George with its picturesque clocktower rising over the village. On the western slopes of Mt Elikonas, just outside Distomo village (the site of one of Greece’s most tragic massacres by Nazi occupiers in WWII) is the stunning monastery of Osios Loukas (St Luke). The large walled complex contains two adjoining churches, one of which is the 10th Century Church of the Theotokos, dedicated to the Virgin Mary. Adjoining it is the Katholikon cathedral, built in 1011. 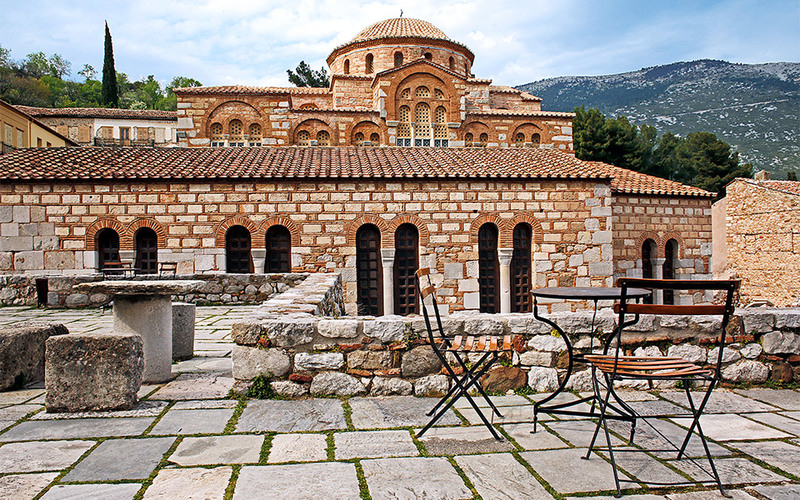 A bell-tower, monastic cells, a refectory and a tourist shop are also located in the complex, where classic Byzantine architecture of russet and cream colored stone bricks and tiled ceramic domed roofs dominate in the exterior. Inside one can admire glossy marble and dazzling wall and ceiling frescoes. Tickets are 12 euros (full) or 6 euros (reduced) for one day. Tel. (+30) 22650 82313 & (+30) 22650 82312. For the best Formaela cheese: Oraion Gefseis have their own free-range herds and make all their cheeses (anthotyro, gruyere, formaela) from small batches of fresh milk. They also sell organic herbs from Mt Parnassos, Amfissa olives and other delicacies. Tel. (+30) 22670 31801. Arachova Bars: Isidora Gallery Bar Tel. (+30) 694 437 8448 • Sehre Cafe Tel. (+30) 2267 031518 • Dr John Chillout Bar Tel. (+30) 694 981 8888.